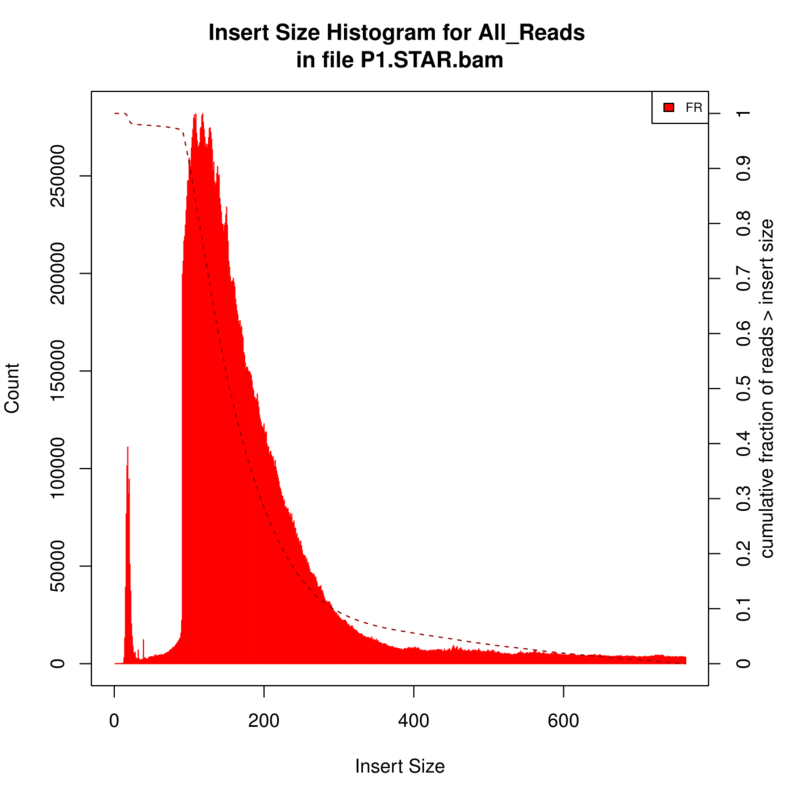 I'm aligning some mouse RNA-Seq data (paired, 2x101) against the genome using STAR. After that, I analysed the insert size with Picard. 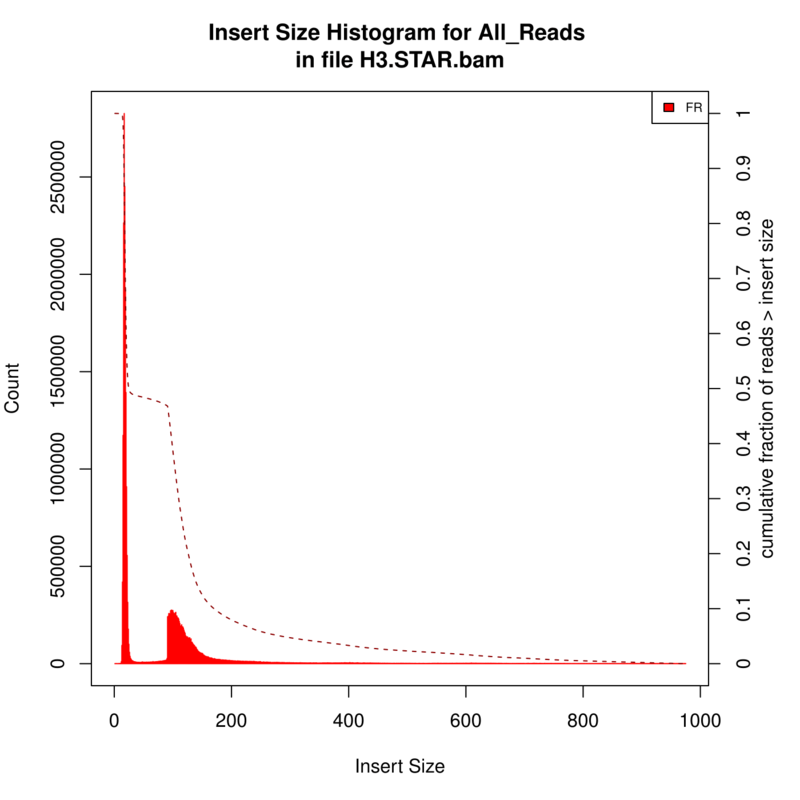 Here are the two kinds of Insert Size Histograms. Which the first one seems so weird, can anyone explain to me what reasons can lead to the first Histogram? Were these samples ribo-depleted? If so have you checked to see the efficiency of that process? Use the rDNA repeat of mouse and align your data to it. Other thing to check is to see if you have optical/PCR duplicates. clumpify from BBMap suite would be the tool of choice there. I have to ask the person who did the experiment to make sure whether is ribo-depleted or polyA captured. I have depleted the rRNA using sortmerna and mapped the data to mouse rRNA, and got 0% alignment. You mean the peak of small insert sizes in the first histogram can be caused by optical/PCR duplicates? Good to know that you have eliminated the possibility of presence of rDNA. Have you looked at some of those small inserts (left over after trimming)? What do they blast to? Is there is a possibility that the trimming missed some adapters? Do you know how to extract those small inserts? Assuming your reads are just the inserts left after trimming you can use reformat.sh from BBMap suite to grab them in a new file. reformat.sh in=trimmed.fq.gz out=short.fq.gz maxlen=30 (adjust the length number as needed, use in1= in2= out1= out2= if you have PE reads). Maybe I have to mention that to do comparison I also do alignment without any trimming, the firgure I got looked simmilar. Since without trimming the read length are all 101, I still have the small inserts. So how do the inserts calculate? I don't think I can use the maxlen=30 to extract the small inserts. The inserts are calculated based on alignment in BBMap. I assume it is the same for STAR. You should be able to get the small inserts by trimming using bbduk.sh. bbduk.sh in=your_reads.fq.gz out=small_inserts.fq.gz ktrim=r k=23 ref=/path_to/adapters.fa (included in BBMap) maxlength=30.